Then he lifted him up. OON AFTERWARD JESUS gave to the people in Jerusalem the parable or story of "The Good Shepherd." "Verily, verily (that is, 'in truth, in truth'), I say to you, if any one does not go into the sheepfold by the door, but climbs up some other way, it is a sign that he is a thief and a robber. But the one who comes in by the door is a shepherd of the sheep. The porter opens the door to him, and the sheep know him, and listen to his call, for he calls his own sheep by name and leads them out to the pasture-field. And when he has led out his sheep, he goes in front of them, and the sheep follow him, for they know his voice. The sheep will not follow a stranger, for they do not know the stranger's voice." The people did not understand what all this meant, and as Jesus explained it to them, he said: "Verily, verily, I say unto you, I am the door that leads to the sheepfold. If any man comes to the sheep in any other way than through me and in my name, he is a thief and a robber; but those who are the true sheep will not hear such. I am the door; if any man goes into the fold through me, he shall be saved, and shall go in and go out, and shall find pasture. "The thief comes to the fold that he may steal and rob the sheep, and kill them; but I came to the fold that they may have life, and may have all that they need. I am the good shepherd; the good shepherd will give up his own life to save his sheep; and I will give up my life that my sheep may be saved. "I am the good shepherd; and just as a true shepherd knows all the sheep in his fold, so I know my own, and my own know me, even as I know the Father, and the Father knows me; and I lay down my life for the sheep. And other sheep I have, which are not of this fold; them also I must lead; and they shall hear my voice; and there shall be one flock and one shepherd." "I send you forth as lambs among wolves. Carry no purse, no bag for food, no shoes except those that you are wearing. Do not stop to talk with people by the way; but go through the towns and villages, healing the sick, and preaching to the people, 'The kingdom of God is coming,' He that hears you, hears me; and he that refuses you, refuses me; and he that will not hear me, will not hear him that sent me." "Lord, even the evil spirits obey our words in thy name!" "I saw Satan, the king of the evil spirits, falling down like lightning from heaven. I have given you power to tread upon serpents and scorpions, and nothing shall harm you. Still, do not rejoice because the evil spirits obey you; but rejoice that your names are written in heaven." And at that time, one of the scribes--men who wrote copies of the books of the Old Testament, and studied them, and taught them--came to Jesus and asked him a question, to see what answer he would give. He said: "Master, what shall I do to have everlasting life?" Jesus said to the scribe: "What is written in the law? You are a reader of God's law; tell me what it says." "Thou shalt love the Lord thy God with all thy heart, and with all thy soul, and with all thy strength, and with all thy mind; and thou shalt love thy neighbor as thyself." Jesus said to the man: "You have answered right; do this, and you shall have everlasting life." But the man was not satisfied. He asked another question: "And who is my neighbor?" To answer this question, Jesus gave the parable or story of "The Good Samaritan." He said: "A certain man was going down the lonely road from Jerusalem to Jericho; and he fell among robbers, who stripped him of all that he had and beat him; and then went away, leaving him almost dead. It happened that a certain priest was going down that road; and when he saw the man lying there, he passed by on the other side. And a Levite, also, when he came to the place, and saw the man, he too went by on the other side. 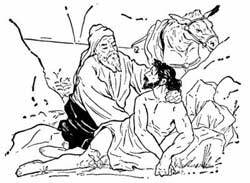 But a certain Samaritan, as he was going down, came where this man was; and as soon as he saw him, he felt a pity for him. He came to the man, and dressed his wounds, pouring oil and wine into them. Then he lifted him up, and set him on his own beast of burden, and walked beside him to an inn. There he took care of him all night; and the next morning he took out from his purse two shillings, and gave them to the keeper of the inn, and said: 'Take care of him; and if you need to spend more than this, do so; and when I come again I will pay it to you.'" "Which one of these three, do you think, showed himself a neighbor to the man who fell among the robbers?" The scribe said: "The one who showed mercy on him." Then Jesus said to him: "Go and do thou likewise." By this parable, Jesus showed that "our neighbor" is the one who needs the help that we can give him, whoever he may be.